Ceramic heating plates are ceramic coated. ceramic coated heating plates prevent from being damaged and scratched easily. So there is no danger of being scratched on the surface of heating plates. And the surface of heating plates is very soft and convenient to create desired hair style. It is normal that there is small gap (0.8mm) between two heating plates. When heating plates are heated, the end of two arms of heating plates are bent outwards. Then there will be no gap between the two heating plates. Ceramic coated heating plates, ceramic emits negative-ions to prevent damage of hair. And it is also 100% ceramic heating plates. Substance of the body is made of PBT with 30% of glass to endure up to 210℃. If you want PBT with 40% of glass, it is possible. In that case heat resisting temperature is over 220℃. If you don't want PBT, we can use nylon 66. The price is the same as PBT. 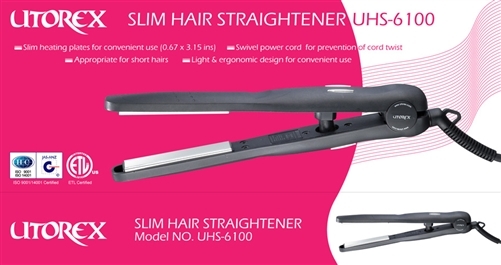 Joint part of two arms of hair straighteners is very strong and solid compared with other ompanies products. Our power cord is rotating in the angle of 360 degrees for prevention of cord twist. bles to handle this product very conveniently. 2.4m long power cord are adopted to use the product very conveniently. Slim sized generally coated heating plates(17 x 80 mm) are appropriate for straightening and waving shortly cut hair. Ceramic heaters, which are adopted for most of hair straighteners, enable to raise the temperature of heating plates quickly and control the temperature automatically and use the product very safely.